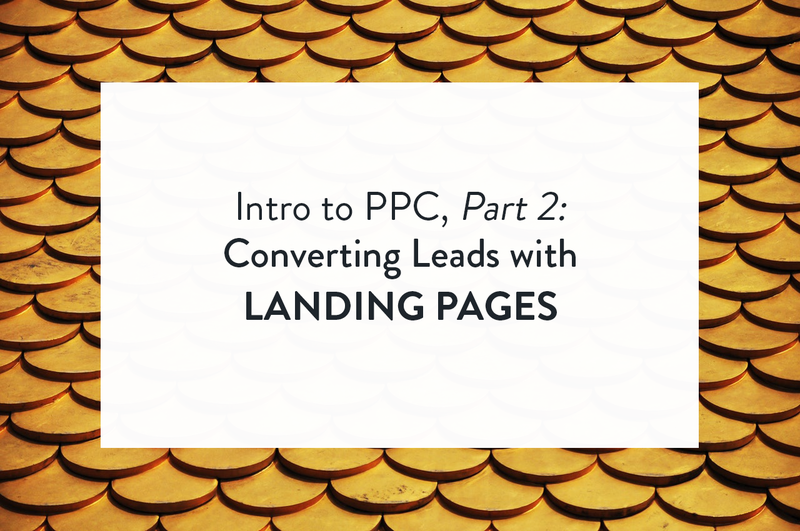 This is a continuation of our Introduction to PPC series. Check out part one here. Understanding the world of pay-per-click marketing is critical, but it’s only one leg of the journey from lead to customer. Once you drive new leads to your site from PPC advertising, you have to be able to convert them. Conversions are a combination of finding the right keywords and matching them to specifically-designed landing pages. Deep keyword research is the first step, but those keywords must match your landing pages seamlessly. So your spiffy ad copy is getting leads to click – now you have to drive them further down the conversion path with a relevant landing page. Now, you might be tempted to send your ad traffic directly to your homepage, but you’d be missing out on a big opportunity for conversions. The headline reinforces the language used in the search term and ad copy with “AI personal assistant.” This makes it easier for the person searching to want to convert – it’s what they were searching for, after all. If x.ai had driven traffic to their homepage instead, the experience would have been a bit different. Instead of “AI personal assistant,” the home page is a bit more general, with “AI scheduled meetings” in the header text. You’ll also notice two more important differences between the landing page and the home page – the call to action and the navigation. The call to action is front and center on the landing page – this makes sense because people coming to this page are searching for a specific solution and are ready to convert. At the same time, there is no top navigation bar on the landing page. The one, single, important purpose of the landing page is to get visitors to sign-up for a free trial – not to get distracted by the “About” page or blog and bounce off the site. The home page handles all types of traffic – referral links from other websites, organic search traffic, social media traffic as well as direct visits. It’s more informational, serving up information like “How it Works” and “Pricing” for visitors in the information-gathering stage of the buyer’s journey. There’s also a “Login” button for customers accessing their account through the website. Bring your call-to-action front and center (like free trial, free demo, newsletter sign-up), and keep your web form simple and easy to complete. Tying a specific, single-purpose landing page to specific PPC keyword groups can help you boost conversion rates, turning precious ad spend into new customers. We’re all pretty much digital natives these days and are savvy to the fact that we’re clicking on an ad. Visitors to your PPC landing pages are probably a bit skeptical about signing up for just anything with just anyone. Incorporating trust into your landing page can be accomplished in several ways and can help turn a wary visitor into a new lead. “Don’t take our word for it.” Share what real people are saying about your product or service through testimonial quotes or videos. Bonus points if it’s relevant to the keyword search. Have a five-star rating? Share it on your landing page to build instant trust in your brand. Use social media tools to show visitors that you have a big social footprint and that their friends like you, too. Are your partners or clients well-known brands? Use their logos on your landing page to bring credibility to your business. A perfect example is how HighFive video conferencing software brings trust and credibility to their landing page with highly recognizable customer logos, a customer quote from a well-known brand, and their high ratings from multiple review sites. Every market is competitive, and adding the trust-factor to your landing page can help you stand out from the crowd. While a stellar landing page is key to conversion, a little brand recognition can go a long way. For instance, if your company is looking for a collaboration tool and you are presented with ads for “Slack” and “Flowdoc,” chances are that you’ll be checking out Slack – a highly recognizable brand synonymous with getting work done. But not every company has a huge budget to spend on advertising. The good news is, you only need brand recognition among your ideal buyer – not the whole world. Using strategies like retargeting, social media and email marketing can get your name and message in front of the right audience. That way, when you do come up in the search results, you’re a recognizable brand with a better chance for conversion. Here’s a great example of Quickbooks using retargeting to re-engage visitors who have gone to their site, but haven’t converted. Once your PPC campaign is driving visitors, your landing page is up and the conversions are rolling in, you might be ready to put your feet up and keep things on autopilot. Unfortunately, that’s a great way to miss out on valuable ROI. After your landing page is honed and your PPC campaign set up, you still need to evaluate how successful your campaign is. For that, stay tuned for our next and final blog post in this series, “Intro to PPC, Part 3: Measuring the ROI of PPC”.